Introduction: Chronic suppurative otitis media (CSOM) is a long-standing infection of middle ear cleft having a permanent perforation in the tympanic membrane with or without discharge. This is usually classified into two main groups: tubotympanic and atticoantral disease. The atticoantral type is called unsafe type because of the associated complications due to granulations and cholesteatoma which may be life-threatening. Tubotympanic type with central perforation is usually not associated with major complications such as cholesteatoma formation. Materials and Methods: This study has been conducted in the Department of ENT, Alluri Sita Rama Raju Academy of Medical Science, Eluru, A.P., India. Study group includes 210 patients having CSOM with central perforations in the tympanic membranes who underwent different types of procedures in our department. Preoperatively, all the patients were evaluated with otoscopy, microscopy, pure-tone audiometry, and some patients with computed tomography scan. All the patients had been evaluated peroperatively for confirmation of preoperative findings under microscope. Results: Surprisingly, seven patients with central perforations were having cholesteatoma, confirmed by biopsy. Conclusion: This study suggests that no perforation in CSOM is safe. Any patient coming for medical advice having CSOM with any type of perforation should be evaluated properly to exclude the underlying pathology like cholesteatoma which may be dangerous later on if not identified. CSOM is usually classified into two main groups: tubotympanic and atticoantral disease. Tubotympanic type is otherwise called safe type or benign type because it is not associated with any serious complications. The atticoantral type is called unsafe or dangerous type because of the associated complications which may be life-threatening at times. These complications are mainly due to granulation tissue and cholesteatoma causing bone erosion and necrosis which may involve the vital structures such as facial nerve, inner ear, and intracranial components. These also erode the ossicles causing hearing loss. Central perforations are considered safe as cholesteatoma is usually not associated with them. Central perforations may be anterior, posterior, inferior (in respect to handle of malleus), and subtotal. Again central perforation may be dry or active, giving history of intermittent profuse mucoid discharge. Rarely, the discharge is continuous and malodorous. Discharge is precipitated by passage of water through perforation and upper respiratory tract infection. The diseases usually found in active central perforations are granulation tissue and polyp formation. Ossicular chain fixation or erosion may be found in both active and dry central perforations. Few literatures described the cholesteatoma formation in central perforations. But the prevalence is very low. This study has been conducted over a period of 2 years in the Department of ENT and Head and Neck Surgery, Alluri Sita Rama Raju Academy of Medical Sciences, Eluru, A.P., India. Total patients studied during the period were 210, out of which 102 were males and 108 were females. Patient of CSOM with central perforation which may be active or dry. Patient willing for surgery offered to him or her. Patient giving consent for the study upon him or her. Patient willing to come for regular follow up and obey the medical advice. Patient not giving consent for study upon him. Patient of CSOM with other types of perforations except central type. Patient not willing for surgery. Any patient with CSOM coming to ENT OPD with central perforation was evaluated properly with detail history taking, thorough clinical examination by otoscopy, examination under microscope, hearing assessment by pure-tone audiometry, x-ray of mastoid regions, tests for Eustachian tube More Detailss function, and culture and sensitivity test whereever required. Eustachian tube function test was done by valsalva test, Eustachian tube catheterization, or simply by putting ear drops in the ear and asking for bitter tests in the throat. 35% people cannot perform valsalva maneuver properly. So failure of this test does not prove the blockage of Eustachian tube and we have to rely on other tests. Computed tomography (CT) scan was done in some cases to exclude middle ear and mastoid pathology to assess the ossicular chain status and status of the facial canal and semicircular canals. Patients with dry central perforations in TMs which were dry since more 6 months, with normal Eustachian tube function, were offered only tympanoplasty despite the status of mastoid air cell system on X-ray. In patients with dry central perforations more than 6 months where Eustachian tubes are nonfunctional and not improving with medical treatment, usually we preferred cortical mastoidectomy with tympanoplasty despite the status of mastoid air cell systems. In patients with intermittently or continuously discharging ears despite medical treatment, we choose proper antibiotics by culture and sensitivity test and preferred to do cortical mastoidectomy and tympanoplasty as one-stage procedure. In cases, patients with extensive diseases in middle ear and mastoid, i.e., cholesteatoma, where eradication of the disease was not possible, we preferred modified radical mastoidectomy with or without tympanoplasty. All the patients were evaluated under microscope during surgery and biopsy was done to confirm the preoperative findings. Out of 210 patients we studied, 102 were males and 108 were females and 44 numbers of patients were under 15 years category [Table 1]. Youngest patient in our series was a 9-year-old female child in whom cortical mastoidectomy and type 1 tympanoplasty were done. Oldest patient in our series was a 55-year-old female in whom cortical mastoidectomy and type 2 tympanoplasty were done because of the partial erosion of the malleus bone. All the above patients came to our hospital with various symptoms given in [Table 2]. Majority of the patients (73 in number) came without any symptoms and they just came to close the perforation on the TM, diagnosed somewhere else. Next common symptom was reduced hearing (81 patients). Few of them came with complications such as tinnitus (20 patients), vertigo (2 patients), ear pain (5 patients), and intermittent foul smelling discharge (4 patients). All the patients were evaluated preoperatively and following procedures were offered to them [Table 3]. Maximum number of patients were offered cortical mastoidectomy with tympanoplasty (105, i.e., 50%) followed by only tympanoplasty (102, i.e., 48.6%). Only one patient was offered modified radical mastoidectomy with tympanoplasty because of extensive disease. With both pre- and peroperative evaluation using different methods of investigations combined with conformational biopsy of the suspected lesions following pathological findings were found [Table 4]. 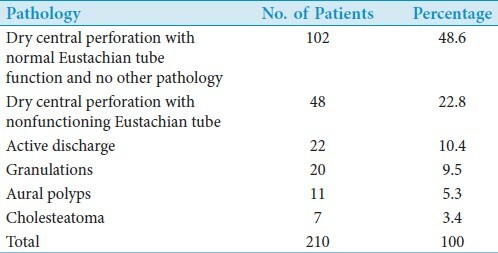 Maximum numbers of patients (102, 48.6%) were having dry central perforation with normal Eustachian tube function. Next group was having dry central perforation with nonfunctioning Eustachian tube (48, 22.8%). 22 patients, i.e., 10.4% were having active discharge, 20 patients, i.e., 9.5% were having granulations, 11 patients, i.e., 5.3% were having aural polyp, and surprisingly 7 patients, i.e., 3.4% were having cholesteatoma which was confirmed by histopathological study. Out of these seven patients, in three cases cholesteatoma were confined to posterior mesotympanum only, in two cases cholesteatoma involved posterior mesotympanum, attic, and antrum, and in other two cases cholesteatoma from posterior mesotympanum extended to sinus tympani, facial recess, attic, and antrum. There was no evidence of bone erosion in these cases. When we reviewed all the seven patients with central perforation and cholesteatoma, we found all of them came with complaints of either intermittent foul smelling ear discharge or intermittent pain in the ear and reduced hearing. On examination, four of seven patients were having dry perforation and three patients were having scanty nonfoul smelling watery discharge. All the seven patients were having sclerosed mastoid on X-ray, and cholesteatoma was found on CT scan. These were confirmed by excision of the sac and histopathological study. Four cholesteatoma cases were managed by cortical mastoidectomy and tympanoplasty as one-stage procedure and in remaining three cases modified radical mastoidectomy was done along with type 3 tympanoplasty. Cholesteatoma is a sac containing central keratin debris surrounded by keratinized squamous epithelium in the fibrous tissue matrix and which has got bone eroding property. Cholesteatoma can be classified as congenital and acquired, and acquired can be primary and secondary. Secondary cholesteatoma is commonest and is found in case of CSOM with attic and marginal perforations. Cholesteatoma formation in CSOM with central perforation is very rare. Most common sites of origin of cholesteatoma are posterior epitympanum, posterior mesotympanum, and anterior epitympanum in the order. In a series of 1024 cholesteatoma patients described by Charles D. Bluestone, Jerome O. Klein 2007, a cholesteatoma was found in 42% in the attic in 31% in posterior superior quadrant, in 18% when it was a total perforation, in 6% when there was a central perforation and in 3% when there was no perforation. Sudhoff, et al in view that most operations can be completed in one stage, removed the cholesteatoma and then reconstructed the ossicular chain at the same time. A two-stage procedure is indicated only in special situations. When the surgeon has doubts over whether he or she has removed a cholesteatoma completely or, in rare cases, it is not possible to remove all the squamous epithelium from the oval window or between the crura of the stapes, a second-look operation is recommended 1 (in children) or 2 years later. We also followed the same protocol in our series. Today, in surgical treatment of CSOM, it is not possible to eliminate cholesteatoma and infections by preserving normal anatomic structures and to regain hearing function in each and every patient. Although restoration of the hearing loss and the preservation of anatomy are important aspects, eradication of the disease should be the main principle in the surgical procedures. , In our series, we also followed the same principle in restoring the anatomy by offering maximum patient cortical mastoidectomy and tympanoplasty. But in case of extensive disease, we gave preference to eradication of the disease by doing modified radical mastoidectomy and tympanoplasty. This study shows that although cholesteatoma is commonly found in CSOM with attic and marginal perforations, it is also found in case of central perforations. Although the involvement is rare, still we cannot neglect any patient and allow him or her to lend in complications. In this study, the prevalence of cholesteatoma in CSOM with central perforation is 3.4%. This study also suggests that no perforation in CSOM is a safe type of perforation. We should not stamp the disease as safe or unsafe depending on the site of the disease (tubotympanic or atticoantral) or the type of the perforations. Safe or unsafe type of CSOM depends on the presence or absence of cholesteatoma. So it is better to say safe type of CSOM is the CSOM without cholesteatoma and unsafe type of CSOM is CSOM with cholesteatoma. Furthermore, any patient of CSOM with any type of perforation if complaining of intermittent foul smelling ear discharge and/or intermittent otalgia irrespective of the condition of the ear (dry or active) should arouse the suspicion of hidden cholesteatoma and accordingly all the investigations should be done to exclude the pathology. 1. Shrikrishna BH. Ossicular defects in patients with non cholesteatomatous CSOM, OJ Otol HNS 2010;4:14. 2. Varshney S, Nangia A, Bist SS, Singh RK, Gupta N, Bhagat S. Ossicular chain status in chronic suppurative otitis media in adults. Indian J Otolaryngol Head Neck Surg 2010;62;421-6. 3. R.P. Mills, Management of CSOM, Scott- Brown's Otolaryngology. 6 th ed, 3/10/1. Oxford: Reed Educational and Professional Publishing Ltd; 1997. 4. Dhingra PL. Disease of Ear Nose and Throat. 3 rd ed. Amsterdam: Elsevier; 2004. p. 91. 5. Paço J, Branco C, Estibeiro H, Oliveira E Carmo D. The posterior quadrant of the tympanic membrane. Am J Otol HNS 2009;140:884-8. 6. Amiri C. Hypothesis based on anatomical aberration and certain condition responsible for cholesteatoma formation. In: Cholesteatoma, First international conference; 1997. 7. R.P Mills, Management of CSOM, Scott- Brown's Otolaryngology. 6 th ed, 3/10/2. Oxford: Reed Educational and Professional Publishing Ltd; 1997. 8. Aquino JE, Cruz Filho NA, de Aquino JN. Epidemiologies of middle ear and mastoid cholesteatomas. Braz J Otolaryngol 2011;77:341-7. 9. Yuasa Yu. Cholesteatoma with Central Perforation of Tympanic Membrane. J Otol Jpn 2005;15:129-32. 10. Sudhoff H. Ossicular chain reconstruction, middle ear surgery. New York: Springer; 2006. p. 50. 11. Jeng FC, Tsai MH, Brown CJ. Relationship of preoperative findings and ossicular discontinuity in chronic otitis media. Otol Neurotol 2003;24:29-32. 12. Syms MJ, Luxford WM. Management of cholesteatoma; status of the canal wall. Laryngoscope 2003;113:443-8. Prakash, R., Juyal, D., Negi, V.,Sharma, M., Sharma, N.